This reading group guide for A Kind of Mirraculas Paradise includes an introduction, discussion questions, and ideas for enhancing your book club. The suggested questions are intended to help your reading group find new and interesting angles and topics for your discussion. We hope that these ideas will enrich your conversation and increase your enjoyment of the book. Sandra Allen did not know her uncle Bob very well. As a child, she had been told he was “crazy,” that he had spent time in mental hospitals while growing up in Berkeley in the sixties and seventies. But Bob had lived a hermetic life in a remote part of California for longer than she had been alive, and what little she knew of him came from rare family reunions or odd, infrequent phone calls. Then in 2009 Bob mailed her his autobiography. Typewritten in all caps, a stream of error-riddled sentences over sixty, single-spaced pages, the often incomprehensible manuscript proclaimed to be a “true story” about being “labeled as a psychotic paranoid schizophrenic” and arrived with a plea to help him get his story out to the world. In A Kind of Mirraculas Paradise, Allen translates her uncle’s autobiography, artfully creating a gripping coming-of-age story while sticking faithfully to the facts as he shared them. 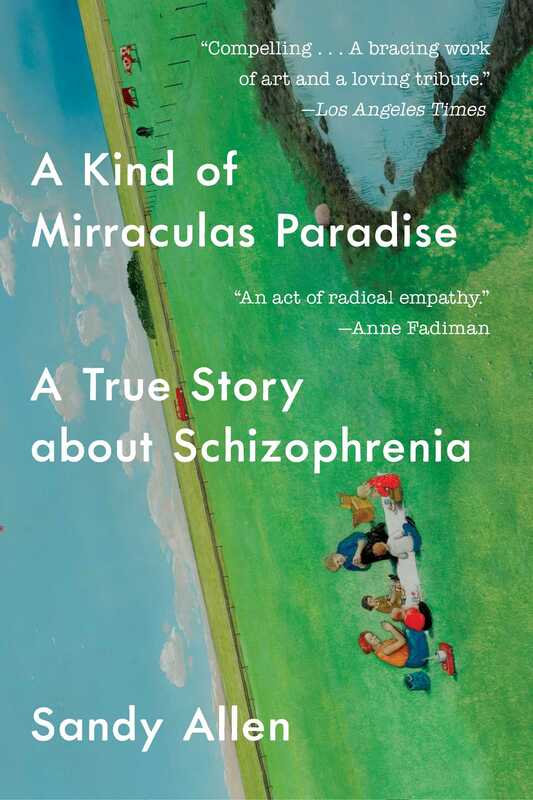 Lacing Bob’s narrative with chapters providing greater contextualization, Allen also shares background information about her family, the culturally explosive time and place of her uncle’s formative years, and the vitally important questions surrounding schizophrenia and mental health care in America more broadly. 1. A Kind of Mirraculas Paradise has an unconventional structure, with chapters alternating between Bob’s autobiography and Sandra’s perspective on what happened to Bob. Why do you think she organized the narrative this way? Discuss instances where the broader contextualization provided by Sandra’s chapters directly influenced your reading of Bob’s own account of his experiences—and vice versa. 2. On reading her uncle’s manuscript early on, Sandra notes, “What surprised me was how much I liked it—his word choices and style” (page 14). Describe Bob’s writerly sensibilities. In what ways did his turn of phrase, word choice, syntax, sentence structure, and tone stand out to you? 3. Some readers may question whether the account Bob wrote should be considered nonfiction. What do you think? In your view is the subtitle, “A True story about Schizophrenia,” fitting? 5. Bob’s father, Gene, and his stepmother, Agnes, both consider what happened to Bob to be a “tragedy.” In what ways is Bob a tragic figure? In what ways were his circumstances tragic? Should any individual(s) be blamed for what happened to Bob? Why or why not? 6. Bob’s manuscript is primarily about his life during the late sixties and seventies, beginning when he is in elementary school and taking us through his adolescence and twenties. Discuss the universal and particular elements of Bob’s coming-of-age—of his quests to find employment, friendship, and love. In what ways was he a product of the culture of the Bay Area during this era? In what ways was his story influenced by his political and socioeconomic background? 8. Sandra is mentioned in Bob’s manuscript exactly once, in a line announcing her birth in 1987. Did this mention make a difference to you when considering her role as the translator of Bob’s biography and author of this book? Why or why not? 9. The title of the book comes from Bob’s description of summers spent at Lake L’Homme Dieu as a child. He later calls his desert shack “paradise” as well (page 256). What are the qualities that make a place paradisiacal for Bob? Compare Lake L’Homme Dieu and the desert shack to living conditions at Herrick Hospital, La Casa Via, and Dorothy’s halfway home, and then to the imaginative societies of Annadonia and Ishmall in Bob’s story. 10. The word “schizophrenic” rarely appears in Bob’s manuscript, possibly, Sandra suggests, as a result of the highly stigmatized nature of the term. Revisit instances where prejudice and misunderstanding surrounding schizophrenia and mental illness are evident—in both Bob’s and Sandra’s chapters. What words and terms are used? How did the meaning and connotation of “schizophrenia” change for you while reading this book? 11. Revisit the last lines of Bob’s manuscript in the chapter titled “The Fifth Portrait” near the end of the book (pages 257–58). What is the effect of reading this undoctored text, exactly as Bob had written it at this point? In what ways does Bob’s description of himself in these lines stand in for the portrait missing from Gene and Agnes’s front hall? In what ways does it not? 12. Sandra’s attitude toward Bob’s manuscript, Bob’s illness, and Bob himself shifted radically over the course of writing this book. How do you imagine that Bob’s attitudes changed during the process of writing his manuscript? How did your own attitudes change as a reader? 1. Consider A Kind of Mirraculas Paradise alongside first-person narratives about schizophrenia, such as The Center Cannot Hold by Elyn Saks and I Never Promised You a Rose Garden by Joanne Greenberg, and memoirs about other forms of mental disorders, such as The Reason I Jump by Naoki Higashida, Look Me in the Eye by John Elder Robison, and The Noonday Demon by Andrew Solomon. How do the works compare and how do they differ? In addition to what we learn about the subject of each memoir, what do these books allow us to realize about society’s treatment of those diagnosed with mental illness? 2. Upon hearing “Voodoo Chile” for the first time on the radio in high school, Bob began to idolize Jimi Hendrix and held him in high esteem for the rest of his life. Listen to the Jimi Hendrix Experience’s album Electric Ladyland on which this track appears. 3. If you feel comfortable doing so, discuss how Sandra Allen’s book has changed your perspective on any family members or friends you have with mental illness.